Last we heard, Bill & Ted 3 was happening soon or not at all according to star Alex Winter. The actor-turned-director is still promoting his latest documentary Deep Web, which actually reunites him with his Bill and Ted's Excellent Adventure co-star Keanu Reeves, who provided the narration. While we don't exactly have another update on Bill & Ted 3, Alex Winter did share some interesting early notes on the original movie. These pages come from Ed Solomon, who wrote both Bill and Ted's Excellent Adventure and Bill and Ted's Bogus Journey with Chris Matheson. They are also penning Bill & Ted 3. Here, we get to see some of the early ideas the duo had for their iconic time traveling teenagers. While the basic idea remains intact, there were a few important changes made. First off, the title was Bill and Ted's Time Van. They were still a couple of losers in a band called Wyld Stallyns, but their two best friends were a 28 year old Sophomore named Rufus and his very intelligent sidekick canine named DogRufus. This was probably an ode to Mr. Peabody and Sherman. Rufus, of course, eventually morphed into the character played by George Carlin and the dog was discarded. And a green van decked out with the Wyld Stallyns logo did show up in Bill and Ted's Bogus Journey, but it wasn't capable of time travel. Maybe that will change in Bill & Ted 3. 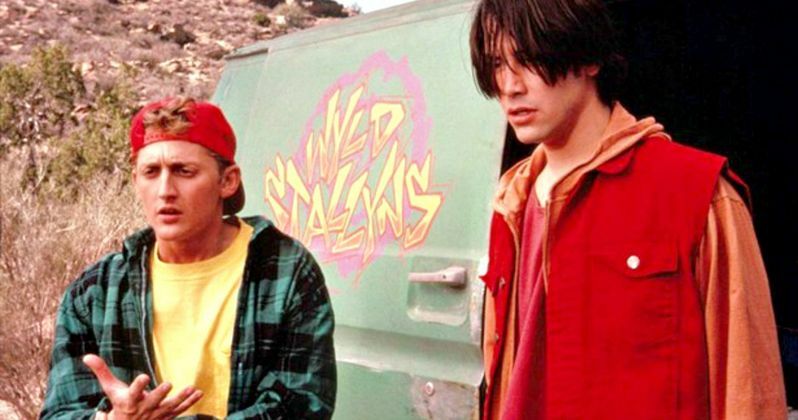 Bill & Ted 3 to Finally Begin Shooting This Spring? Is Bill & Ted 3 Getting a Christmas 2019 Release Date? Keanu Meets Dolly & Fans Go Wild, Did Alex Winter Just Lose His Bill & Ted 3 Job?